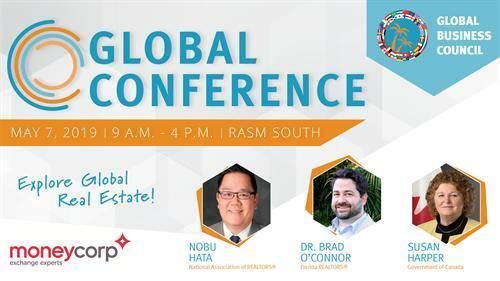 The Global Business Council of the REALTOR® Association of Sarasota and Manatee is hosting their 13th Annual Global Conference on May 7 at RASM South (2320 Cattlemen Road, Sarasota, FL 34232). In a state where international buyers account for more than $24.2 billion in residential real estate, this one-day conference offers global real estate education and networking to help members better understand the global economy, transactions, and relationships. The conference features a review on Florida's top foreign buyer: Canada. Visit Sarasota County will provide an update on local tourism. Dr. Brad O'Connor, Chief Economist of Research with Florida REALTORS®, will present a Florida real estate market update and Nobu Hata from the National Association of REALTORS® will help agents achieve success through inbound and outbound marketing. Sessions run from 9 a.m. - 4 p.m. with a wine and cheese networking reception to follow. Learn more at www.myrasm.com/globalconference.